GPRS was onsite within 24 hours of the general contractor’s request. Upon arrival, the general contractor showed the GPRS project manager the approximate location of the bore path, as well as the area where the new solar car port structures were to be erected. At this point, the project manager onsite thoroughly investigated the areas shown, and used a combination of ground penetrating radar, which is also known as “x-ray”, as well as traditional locating methods using electromagnetic locating, to locate all existing utilities in their path. All findings were marked directly on the surface with their corresponding depths, and explained to the site contact at the completion of the job. The project took approximately three hours to complete, which kept the costs to a minimum. The photo shows an example area where multiple electrical and communication lines were crossing the proposed bore path. GPRS was able to accurately identify electrical, communication, gas, water, fire water, sewer, and storm drain lines to mitigate potential costly damages when boring or excavating. Per normal procedure, DigAlert was contacted at the commencement of the project, but due to the majority of the work being done on a private property, 811 services were not much use to the contractor. As opposed to the normal DigAlert or 811 requests, GPRS will identify and mark private AND public utility locations, as well as give relevant depth information that these public services do not provide. GPRS can operate onsite without the use of existing as-built plans, and can account for the unaccounted for when dealing with subsurface obstacles. With the information provided by GPRS, the team designing the solar structure was able to accurately plan where to place footings for solar structures without fear of discovering a potential obstacle during the construction phase, causing costly shutdown time and additional resources to relocate footing positions for the solar structure. Digging without hiring a third-party utility locating company can be detrimental to project schedules, project budgets, as well as onsite safety for excavators. In addition to scanning areas for utilities, GPRS also has the ability to locate any subsurface obstacle, ranging from old footing foundations, to UST’s, to unmarked graves. GPRS leads the industry with advanced technology, training, and a highly motivated team of project managers that can help with any subsurface imaging needs. 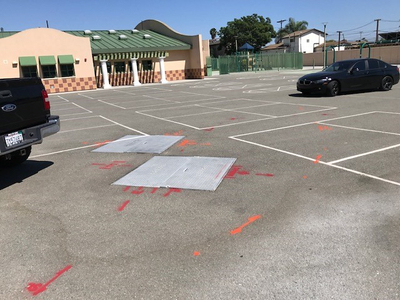 If your company needs to know what lies below the surface in any application, ranging from concrete scanning, concrete x-ray, private utility locating, UST location, or post tension location in the greater San Diego area (including San Ysidro, Alpine, Chula Vista, El Cajon, Poway, Escondido, Fallbrook, Temecula, Murrieta, Menifee, San Clemente, Oceanside, Carlsbad, Encinitas, La Jolla, and Spring Valley), please contact James Petersen at (858) 395-1085 or at james.petersen@gprsinc.com.